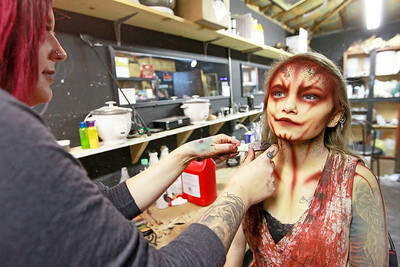 Candace H. Johnson-For Shaw Media Make-up artist Cassie Sychta, of Batavia turns Heather Kufeldt, 19, of Round Lake into a demon for the Realm of Terror Haunted House at Kristof’s Entertainment Center in Round Lake Beach. 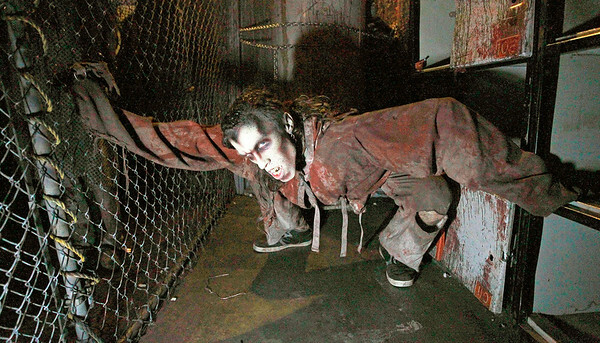 Candace H. Johnson-For Shaw Media Patrick Gocek, of Round Lake Park, portrays a creature as he scares people coming through the Realm of Terror Haunted House at Kristof’s Entertainment Center in Round Lake Beach. 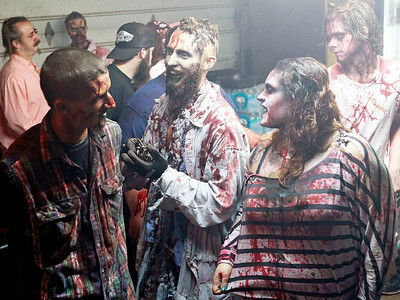 Candace H. Johnson-For Shaw Media Desirea Shannon, 18, of Carpentersville gets turned into a maniac by Nick Fischer, of Wildwood, a special effects makeup artist for the Realm of Terror Haunted House at Kristof’s Entertainment Center in Round Lake Beach. Fischer has been working as a special effects makeup artist with the Realm of Terror for over ten years. 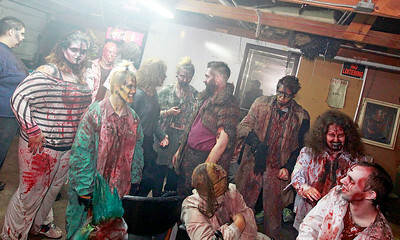 Candace H. Johnson-For Shaw Media Ghouls wait to go into their unique areas to greet visitors after getting their makeup done for the Realm of Terror Haunted House at Kristof’s Entertainment Center in Round Lake Beach. 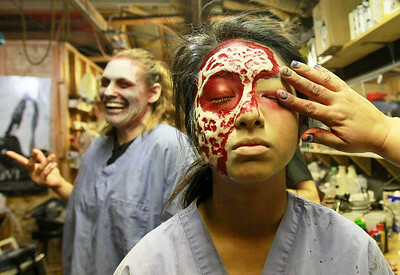 Candace H. Johnson-For Shaw Media Ridyan Olivares, 18, of Round Lake gets her makeup done to look like a burn victim by Tiffany Beaudry, of Fox Lake, a special effects makeup artist, at the Realm of Terror Haunted House at Kristof’s Entertainment Center in Round Lake Beach. 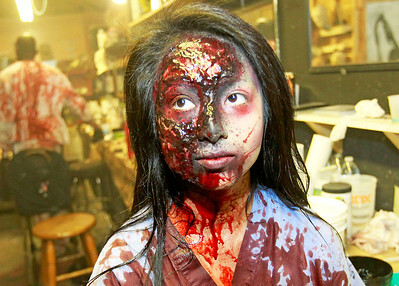 Candace H. Johnson-For Shaw Media Ridyan Olivares, 18, of Round Lake shows how her makeup was done by Tiffany Beaudry, of Fox Lake, a special effects makeup artist, to turn her into a burn victim for the Realm of Terror Haunted House at Kristof’s Entertainment Center in Round Lake Beach. Desirea Shannon, 18, of Carpentersville gets turned into a maniac by Nick Fischer, of Wildwood, a special effects makeup artist for the Realm of Terror Haunted House at Kristof’s Entertainment Center in Round Lake Beach. Fischer has been working as a special effects makeup artist with the Realm of Terror for over ten years.